Our tablet speed test shows that Apple's latest tablet is no match for the Surface Pro 3. Apple’s unfeasibly thin iPad Air 2 is one of the world’s best-selling tablets. But is it the fastest? Not according to our lab experts. 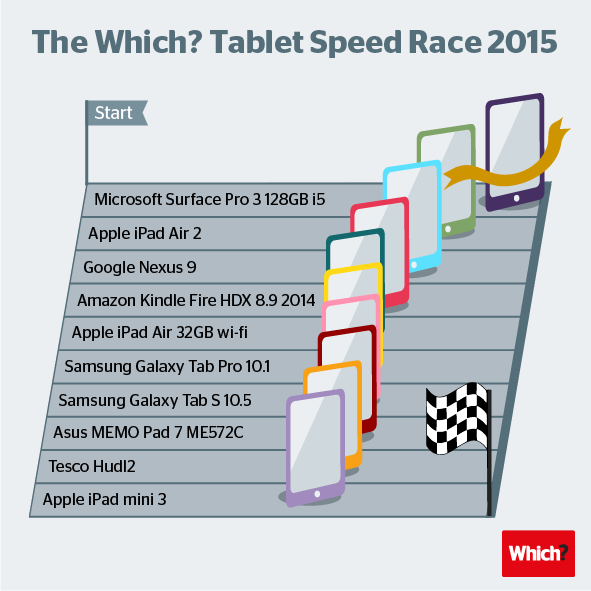 Microsoft’s Surface Pro 3 has topped our tablet speed test ahead of the Air 2. Despite Apple’s claims that its flagship full-sized is “as powerful as many personal computers”. Our results weren’t much better at for Apple at the compact end of the market. Its £319 iPad mini 3 proved slower than Tesco’s budget-friendly Hudl 2, which costs only £99. 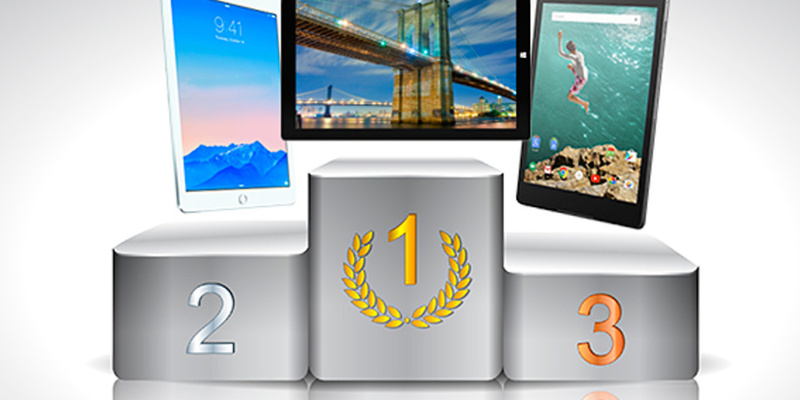 Read on to find out how 10 of the most popular tablets around placed in our speed test. To assess a tablet’s speed, we use the industry-recognised Geekbench software. It puts tablets’ processors through their paces by seeing how quickly they can complete simulations of real-world tasks. Their performance is then quantified to give a final numeric score – the bigger the score, the faster the tablet. So if you’re somebody who doesn’t like to be left waiting for apps and web pages to load, then only the highest scorers will do. According to Geekbench, the explosive Surface Pro 3 is 20% faster than any of its rivals, which include flagship tablets from the likes of Apple, Google and Amazon. Elsewhere, Samsung’s tablets are way off the pace – the Galaxy Tab Pro 10.1 is down in sixth place, and only around half the speed of the Surface Pro 3. The Apple iPad mini 3 brings up the rear – it’s almost three times slower than the Surface Pro 3. That’s not necessarily surprising for a compact tablet. But it’s more shocking to discover that it can’t even keep up with two of its 7-inch competitors, the Asus MEMO Pad 7 ME572C and Tesco Hudl 2. Should you buy a Surface Pro 3 for its speed? Microsoft claims that the Surface Pro 3 can replace your laptop, while giving the versatility of a tablet. The most popular 128GB version has plenty of storage space, while its Windows 8.1 operating system will soon be upgraded for free to Windows 10. And when it comes to sheer power alone, it’s the closest that any tablet currently comes to a PC. That’s mainly because of its ultra-powerful Intel Core i5 processor. The Surface Pro 3 also strikes a more unwelcome similarity to laptops – its price. You’ll have to shell out £849 for the 128GB model, and even the cheaper 64GB version starts at a lofty £639. And that’s before you add Microsoft’s detachable Type Cover keyboard for another £110. On the other hand, you can get another podium-placed tablet for less than £300. The Google Nexus 9 – with its striking 1536×2048 resolution screen and imperious 8MP camera – is the quickest Android device, leaving the several Samsung and Amazon tablets trailing in its wake. But speed isn’t everything. Even cheaper devices like the Hudl 2 have enough oomph to ably flit between BBC iPlayer and your web browsing app. Our full speed tests also check whether a tablet can apply its Geekbench score in practical scenarios such as video streaming from YouTube and transferring large amounts of data. The very best tablets combine rapid processing with a long-lasting battery, simplicity of use and a dazzling screen. Only the models that tick all our lab test boxes earn the gold medal that is Which? Best Buy status.